When we think of modern robots, the first things that come to mind are usually the very austere industrial kind or some whimsical children’s toy. But at one time, robots were meant for the amusement of wealthy collectors and art enthusiasts. 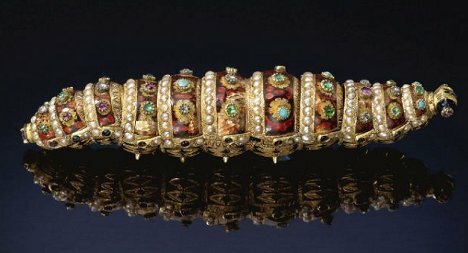 This stunning caterpillar automaton from approximately 1820 is a wonder of both artistry and workmanship. The working automaton, called the Ethiopian Caterpillar, was built by famed Swiss watch maker Henri Maillardet. It was built for wealthy Chinese aristocrats, as evidenced by its opulent ornamentation: rubies, diamonds, emeralds, pearls, and turquoise all set in gold. The caterpillar’s eleven jointed ring segments combine to form a “body” that undulates like a real caterpillar as it moves along on a set of tiny wheels. The work is impressive, especially considering that it is nearly 200 years old. 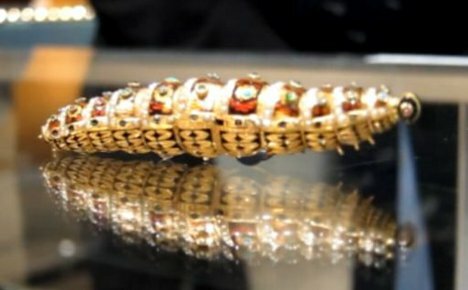 When the Ethiopian Caterpillar was sold at auction in 2010, it fetched a price of more than $415,000. It joins five other such caterpillars known to exist, all of which reside in prestigious art collections. See more in History of Tech or under Vintage & Retro. January, 2013.